Your cultural itinerary includes sights like New Govardhana Australia and Old St Stephen's Catholic Church (Pugin Chapel). Step off the beaten path and head to Boggo Road Gaol (Jail) and Tweed Regional Gallery & Margaret Olley Art Centre. Venture out of the city with trips to Caloundra (Bulcock Beach, Kings Beach, & more), Fingal Head Lighthouse (in Fingal Head) and Coolangatta (Snapper Rocks, Captain Cook Memorial and Lighthouse, & more). Spend the 16th (Thu) exploring the fascinating underwater world at Sea World Theme Park. Spend the 10th (Fri) with some fine spirits on a distillery tour. The adventure continues: contemplate in the serene atmosphere at Chenrezig Institute, see the interesting displays at Queensland Museum & Sciencentre, explore the world behind art at Queensland Art Gallery, and look for all kinds of wild species at Burleigh Head National Park. To find traveler tips, where to stay, and tourist information, you can read our Brisbane vacation builder website . If you are flying in from Malaysia, the closest major airports are Brisbane International Airport and Gold Coast Airport. 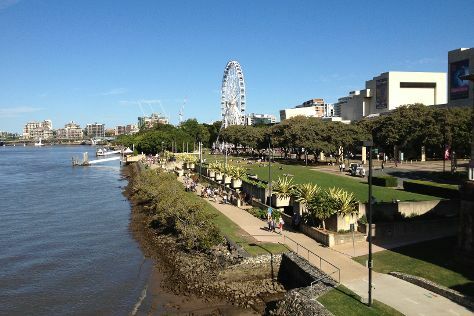 May in Brisbane sees daily highs of 27°C and lows of 15°C at night. Cap off your sightseeing on the 6th (Thu) early enough to travel back home.